Bicheno is a charming seaside town located 176 km south east of Launceston and 182 km north east of Hobart. Formerly known as Waubs Boat Harbour, Bicheno was established as a whaling town in 1803, but began its transformation as a holiday town by the sea in the 1940s. 700 people live permanently in the township, though this grows enormously during the summer months as holiday-makers and tourists flock to the local beaches, holiday homes and markets. The town has developed into the perfect place to relax by white, sandy beaches, eat fresh seafood from the local fish markets and play golf, go diving or snorkeling and marvel at the incredible orange hue of the granite rock typical of the coastline. The activities available in Bicheno are endless - you can hire sea kayaks and explore the coastline from above or below the surface. For those preferring to stay dry, the glass-bottomed boat is a fantastic way to explore the world below, but for those who prefer a tank on their back, the Governor Island Marine Reserve and other local dive sites provide a veritable feast of temperate water diving. There is an abundance of marine life and seabirds in the Reserve - popular with divers year round for the sheer rock walls, caves, sponges, sea whips and abundant fish life. If you prefer to stay on land, there are easily accessible walking tracks to the Diamond Island Nature Reserve, and a short stop for the Blowhole, or you can take a Penguin tour and visit the local rookeries. Waterfalls abound at the nearby Douglas-Apsley National Park, and of course, the world famous Wineglass Bay in the Freycinet National Park is also close by. 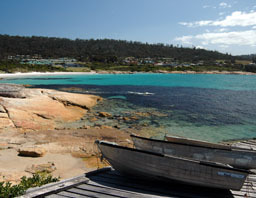 With so much to do and see, diving and staying at Bicheno for the CCW is a must for all divers!